“Ruuf-Dog” is a native Sacramentan and has been playing saxophone since the late ‘80s. Raul performed with On Air as a substitute horn player and eventually joined the band full-time early in 1999. 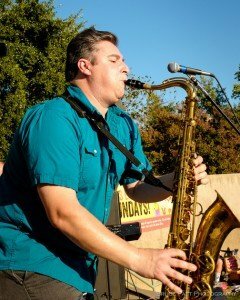 He’s a member of the Sacramento group Joy and Madness and also plays lead tenor saxophone with the American River Monday Night Jazz Ensemble. By day, Raul is a computer consultant. He and his wife and two young children live in Rocklin.